Definition at line 21 of file Response.h. Definition at line 24 of file Response.h. Definition at line 27 of file Response.h. References clone(), operator=(), and pack(). Implemented in Mgr::Response, and Snmp::Response. 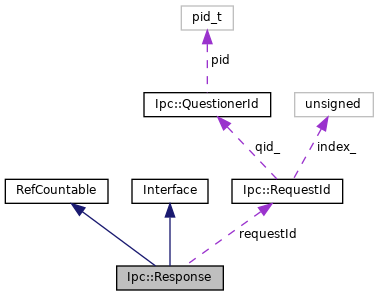 Referenced by Ipc::Inquirer::HandleRemoteAck(), and Response(). Definition at line 38 of file Response.h. 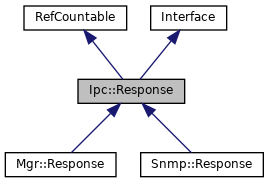 Referenced by Ipc::Strand::handleCacheMgrResponse(), Ipc::Inquirer::HandleRemoteAck(), Ipc::Strand::handleSnmpResponse(), Snmp::operator<<(), Ipc::operator<<(), Snmp::Response::pack(), Mgr::Response::pack(), Snmp::Response::Response(), and Mgr::Response::Response().